Bedford Lutheran Church offers Children’s Church on Sunday mornings during our worship service. 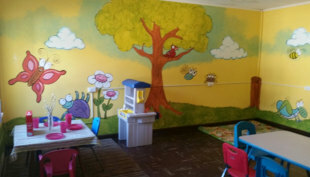 Children's Church is a hybrid of the traditional nursery care and Sunday School. It’s a time for young children to play, color pictures, and listen to a Bible story. Children reunite with their families when Holy Communion is served, giving families this important experience together. Local artist, Lisa Floyd has shared her gift to provide a newly decorated nursery at the Bower Center. We are most grateful for her offering which gives us a wonderful place for our children.